Yes we all know less is sometimes more. This saying does not only belong to the human bodyweight, nope, since the Windows Server Core area we all know less “*.dll” is better. Like this saying, a few days ago I had been asked an interesting question. How can we use the SCOM PowerShell module without installing the entire SCOM console? I thought this is a very good idea and since there are many others which are interested in this scenario I decided to figure it out. Copy the Powershell folder from your SCOM management server in c:\Program Files\System Center 2012\Operations Manager\Powershell to your local server where you need the PowerShell modules. to your local GAC (Global Assembly Cache) on your server where you copied the Powershell folder from Step 1. The Global Assembly Cache is a kind of central store where you can publish your assemblies to the entire system and is located in C:\Windows\Assembly. Now, you just need to drag’n drop the SDK files into the directory and your files will be copied. Note: Should you receive an error that says “Access is denied”, check if UAC is bothering you. There are many sources on the internet about this problem e.g. check this post here . Next, we need to set the module path on our server so that the PowerShell console will find the OperationsManager module if we type Import-Module OperationsManager. Note: This procedure just sets this path for the current session. If you close the windows the path will be gone and you need to set the path again. If you would like to set the path permanently check TechNet how to do it. 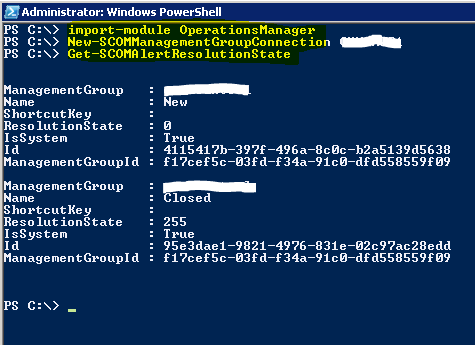 As you can see, you are able to use the full-featured OperationsManager PowerShell as if the SCOM console were installed. Cool, huh? I just tested it in my environment, if you hit any problems let me know. Thanks to Marcel for telling me about this “problem”. erExceptions property for more information. At this point the script tries to load the Microsoft.SystemCenter.CrossPlatform.ClientLibrary.CredentialManagement.dll. Did you follow the procedure exactly as discribed? I tested this procedure with SCOM 2012 SP1. Did you set the module path as described in step 3? I got it working. Thx. Works great! This is a good solution although its not really a sofisticated way. After you done this you need to Copy all of the dll’s to the root folder of the module. Doing this modification to the Manifest file you’re able to copy “C:Program FilesSystem Center 2012Operations ManagerPowershellOperationsManager” to anywhere you want. There were some syntax errors. Thanks for your great comment. I haven’t tried it yet, but it makes sense :). I tried the steps as you mentioned, however I am getting the following error while importing the module. “The assembly “Microsoft.EnterpriseManagement.Core.Dll” was not loaded beacuse no assembly was found”. Note: I had copied the dll’s to the root folder of the module. I’m pretty new to both powershell and SCOM. I got Stephan method to work properly. I wanted to try your method and what is not clear to me is do I have to copy all the dll. files to the server where I need to use the module? how to do that with SCCM ? I am not a SCCM guy :), sorry. Great Article, thanks for spending the time to write it up. We tried the steps you have mentioned, however we are getting the following error when running New-SCOMAgentgroupconnection. I’ve successfully implemented this on a server running Windows Server 2008 R2, putting all the steps into a Powershell script which can be called as part of a scheduled reboot. I’m wondering whether the same steps can be used on Windows Server 2003 as the cmdlets are simply not recognized when I try and execute them. MS state that the cmdlets are supported in Powershell 2.0 but I can find no mention of explicit OS support for them. Has anyone tried this with SCOM 2012 R2? I am having trouble with your directions, can you help? 1. Path C:Program FilesMicrosoft System Center 2012 R2Operations Manager created on computer to run module. 2. 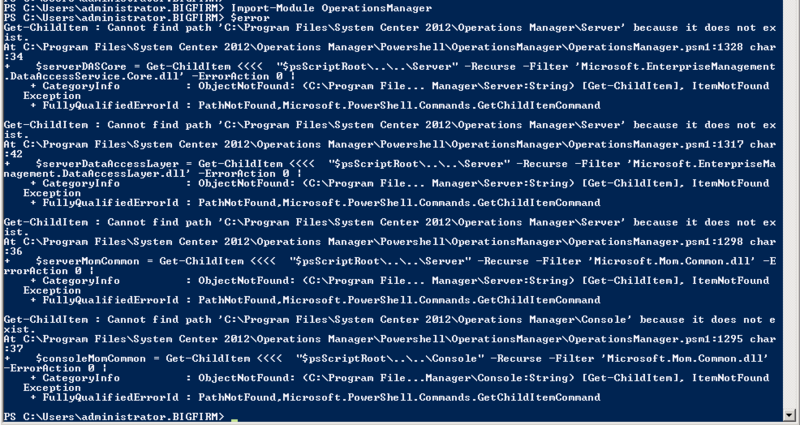 Powershell folder and contents copied to C:Program FilesMicrosoft System Center 2012 R2Operations Manager from the management server. PublicKeyToken=31bf3856ad364e35’ or one of its dependencies. The system cannot find the file specified. I put my copy of what you described in c:operations manager directory. was ever somebody successful with the SCSM PS Module running standalone ? Has ever somebody tried this successfully with the Service Manager CMDLets ? After following the above steps am able to get the SCOM cmdlets. But getting below error. Please help. Get-SCOMAlertResolutionState : The Data Access service is either not running or not yet initialized. Check the event log for more information. looking for an update for server 2012, seems that the GAC folder structure is different as there is now sub-folders. I want get the configuration of ‘Connected Management Group’. How can i do?